This delicious crisp is definitely a dessert, but it isn’t overly sweet. It's perfect on its own, or with a scoop of dairy-free vanilla ice cream. If you prefer a sugary topping, you can increase the brown sugar or coconut sugar to ⅔ cup. Place the walnuts in your spice / coffee grinder, and pulse them 4 or 5 times to coarsely grind with some chunks remaining. I do this in two batches. Place the walnuts, flour, brown sugar, 1 teaspoon cinnamon, ginger, and salt in a large bowl, and whisk with a fork to combine. Add the coconut oil and 3 tablespoons maple syrup and stir with a fork to create a coarse meal. It will be a wetter, chunky crumb. Just make sure you mash in any large chunks of coconut oil. If it is too wet, add 1 to 2 tablespoons flour. Put the pears in a large bowl and drizzle with the lemon juice. Add the starch, 1 tablespoon maple syrup, and ¼ teaspoon cinnamon and stir until combined and no dry starch is visible. Transfer the pears to an 8x8-inch baking dish and shake to help the pears settle in and level out. 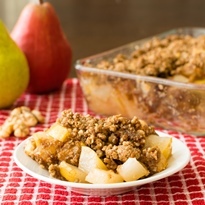 Evenly top the pears with the walnut topping. Bake for about 30 minutes, or until the topping just begins to brown. Let the crisp cool for 10 to 15 minutes before serving.